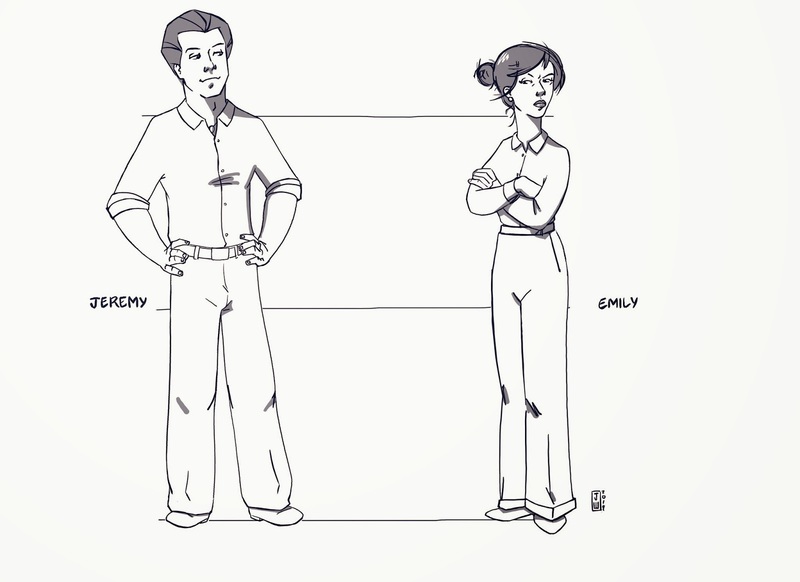 Meet Emily and Jeremy, two of the principal characters in The Unspeakable. Jeremy was relatively easy to come up with. One day I was walking the halls at work and this tall handsome fellow passed me and BAM, right then, I knew how the character looked. It was this fellow's hair, and imagining it on Jeremy that sealed Jeremy's appearance. Smarmy, self-satisfied smile, shirt open at the neck, wearing a pendant of some sort. I hope the proportions look ok. I know the shoulders are a bit narrow, and he's seven heads tall, not eight, but I think he'll do. Em was a lot harder. I've been working on her for a while and while I think I have the body and the face set, I'm still not 100% pleased with her hair, but that's actually ok, because she goes through stages both of costume and hairstyle so getting it totally figured now isn't crucial. Funny, I was in a restaurant when I saw our waitress's hair and BAM!!! I was struck again! That's how Emily's hair is! One comment about this character sheet itself; I usually try to do several drawings of one character on a page to get a complete sense of how they look, but this time, since I knew exactly how Jeremy looks and was a bit unsure about Emily and knew their relative size, I did them both on the same page. As I do more character sketches of these and others, I may cut and paste and compile sheets of each character on their own, but in this case it works well. You get a sense of how they get (or don't get) along. They both look great. And their hair looks great! Jeremy's shoulders could be wider, though, and I think his legs and feet need a bit of work as well. His pants are kinda formless and his feet are teeny-tiny. Man him up a bit! But the faces and character are there and very defined -- the hardest things to capture! Thanks for the comments and suggestions. I'll fix up the shoulders and, yes, the feet too. Man, you're tough!